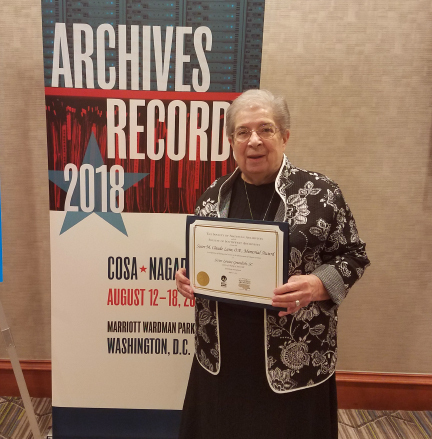 The Society of American Archivists has awarded Sister Louise Grundish, SC, the Sister Claude M. Lane, OP, Memorial Award on August 17, 2018, at the Society of American Archivists Conference in Washington, DC. Named in honor of Sister M. Claude Lane, OP, the first professionally trained archivist at the Catholic Archives of Texas in Austin, the award recognizes individuals who have made significant contributions to the field of religious archives. Sister Louise joins the ranks of many highly successful and well-regarded archivists working in the field. Sister Louise entered the Sisters of Charity of Seton Hill in 1951. After teaching students in the schools of Altoona-Johnstown, Greensburg, and Pittsburgh Dioceses, Sister Louise earned a diploma as a registered nurse at Pittsburgh Hospital School of Nursing; bachelor’s and master’s degrees in nursing from Duquesne University; and a master’s degree in nursing education from the University of Pittsburgh. Highlights of Sister Louise’s distinguished career in nursing include ministry as the operating room supervisor at the former Providence Hospital, director of nursing education at the former Pittsburgh Hospital, and director of nursing services for the Sisters of Divine Providence at Providence Heights. Sister Louise is a beloved alumnae leader with the nursing schools of Pittsburgh Hospital and Duquesne University. Her commitment to the Sisters of Charity has been evident in her service to the community as a vocation director, provincial councilor, and archivist for the congregation, a ministry she began in 2004. Sister Louise has successfully entwined her passion for nursing, education, and her community into a generous life of fruitful ministry.